March 2nd we put on our second Be Bona Fide event. It was a night we will never forget. Close to 200 amazing women gathered in their favorite yoga pants to feel allllll of the feels-- we found our zen, laughed, cried, ate, chatted, and bonded the night away. Whether you came alone, or came with your besties, we grew together and every woman present left with new girlfriends cheering them on. March 2nd was a different kind of conference, it wasn’t just about listening. It was about experiencing what it means to Be Bona Fide for yourself. Through group discussions, Bona Fide confessions, and more, it was an outlet where you didn’t have to be anything but yourself. We welcomed you where you were at - whether you have just gone through the hardest season of life to date, or are the happiest you’ve ever been. It was a night of reflection and learning, but the common theme through every one of our 5 speakers was that of acceptance and hope. The night began with Kiley Beal leading us in a guided meditation and self restorative yoga flow. We were reminded to put our phones away and the importance of being present through our day to day lives. It is so easy to get caught up the busy-ness of this world and forget that the real beauty comes in everyday moments. Thanks to sweet Kiley for reminding us to take time to find peace within ourselves. Next, Darleen Santore known as Coach Dar got brought strength in all of us with her words on how to fight back when life gets hard. As we transitioned from yoga mats to round tables, the Flower Child kept everyone happy and our belly’s full. We mingled outside and new friendships were molded through the commonality of being real. We stuffed our faces with Fiz Drinks, Waffle Love and the amazing Sweet Tooth Fairy treats! Ashley Lemieux played a huge role in the success of this night and we couldn’t have done it without her. She announced our fabulous speakers and shared snippets of her life with with bona fide words about her personal life. She reminded us that we each have a light and the world needs us to shine. Jill Thomas and Bre Lasley shared stories of their world being turned upside down and the means it took to come back from such tragedies. Jill spoke of a life after loss, and finding happiness again in a world where suffering is apart of everyday. No matter what that loss may be, Jill reminded us to take it and make it into something greater, something real. She had a way of speaking directly to each and every woman individually, and I know so many lives were renewed as her words poured over the audience. Bre of Fight Like Girls had tears streaming down every woman’s face as she shared her miraculous story of the physical fight against the attacker who tried to take her and her sister’s life. A very unique story with compelling details, yet Bre was able to make it relatable and personable. We feel so lucky to have met Bre and so encouraged by her message to never stop fighting, whatever your fight may be. Be sure to check out her website and support the brand. These stories left us feeling overwhelmed with hope. In round table discussions lead by inspiring women in the AZ community, each woman had the opportunity to share her our own journey and how social media has played a role in it. We heard so many different takes on what it means to Be Bona Fide in a culture striving for perfection and were so encouraged by what being Bona Fide means to you! Thank you to all of you amazing supporters who came out to explore a night of authenticity. It wouldn’t have been nearly as great without each and every one of you. You mean the world to us and we couldn’t do this without you! *Below are more details on the night- including the speakers, round table leaders and the swag bag contributors. Ashley LeMieux is the founder and CEO of The Shine Project and is a firm believer that everyone was born to Shine. Ashley is a writer, speaker, and entrepreneur who lives in Phoenix, AZ. Her company, The Shine Project, employs at risk youth in America to help them break the cycle and reach their potential. She has a passion for cheering on the under dog, helping women develop themselves personally and professionally, and for allowing others to see the triumphs and heartaches in her life to help them find strength in their own journey. Ashley's life mantra is "Make it Happen", and nothing makes her happier than being able to help women do just that in their own lives. *A percentage of all ticket sales will go to the Shine Project to help mentor and equip inner-city youth with the tools to discover their personal value and pursue a college education. Becky Crosby is the owner and creator behind Whippy Cake. She is a professional stylist turned self-confidence promoter. She loves a beauty tutorial as much as the next girl, but also believes in a world where people put more value on who you are on the inside than what you look like on the outside. On her YouTube & blog, you'll find plenty of beauty and style tutorials, paired with motivational messages and advice on how to be 100% happy by being 100% you, no apologies needed. Darleen Santore makes it her life’s mission to motivate, inspire and awaken greatness in others. Better known as "Coach Dar,” she coaches and helps individuals gain clarity and focus in order to live well, lead well and propel themselves to new heights. For twenty years, she has worked as a Board Certified Occupational Therapist as well as a Life and Leadership Coach. As a therapist, she’s worked side-by-side with individuals who have overcome unimaginable setbacks because of illness or injury. Her life and leadership coaching has paired her with leaders of all walks of life including athletes, performers, artists, entrepreneurs and executives. Her game plan is to help each person reach their peak potential by developing character, inspiring self-confidence and instilling leadership skills that take performance to the next level. Coach Dar’s goal is to create a personalized plan to ‘Level Up’ in life, in business and at home. When Jill Thomas lost her daughter nearly four years ago to a tragic accident, she changed her life and her work. After running a successful film photography business for 10 years, being published in mainstream magazines, and photographing around the world, she now shares her experiences to teach others how to live and create intentionally. The sudden passing of Jill's daughter brought a spiritual awaking and awakened her to the frantic pace and illusory goals she'd been pursuing. Her search for meaning currently involves a daily practice aimed at spiritual intentional living--a path that helped her out of her suffering and darkness. Her attacker is dead but her fight is far from over. After surviving an attempted murder on September 23, 2015, Bre Lasley continues to fight for her future, potential goals, hopes and dreams. Since her attack Bre is now the founder of Fight Like Girls and teamed up with Elizabeth Smart in their fight to help women with whatever they're fighting. Whether it's fighting depression, addiction, loneliness, an abusive relationship, anxiety, an eating disorder, or the aftermath of someone else's stupid decisions. In her unique and personable way she will recount her miraculous story. * A percentage of all ticket sales will go towards Fight Like Girls to help other women fight their fight. These inspiring ladies will lead a table of you women through a series of stimulating and enlightening questions. This will be an excellent opportunity to GET REAL with one another and form new bonds and friendships with the incredible women surrounding you this night. Everyone will randomly be assigned to a table. That way we can all step out of our comfort zones and get to know the influential people around you. | From left to right | Haley from Bloom Head Wraps, Ashley from Big Tough Girl, Jessica from Lumitory, Rachel & Julianna from Flybird Apparel, Christine from Luca Magazine, Jennifer from Soul Carrier, Krista from Her Name is Mud, Caitlin Claire from Dash of Darling, AVE Styles, Kara & Shelly from Raising Wild Swimwear, Celestial Williams from Gather Magazine and Kate from Late With Kate. We are so grateful for our Swag bag contributors! Breea from Tell the Birds will be our videographer for the night. She is incredibly talented and filmed our last event in Utah, if you haven't already seen the video, click 'play' below! Kate will be one of two of our photographers capturing this special night. 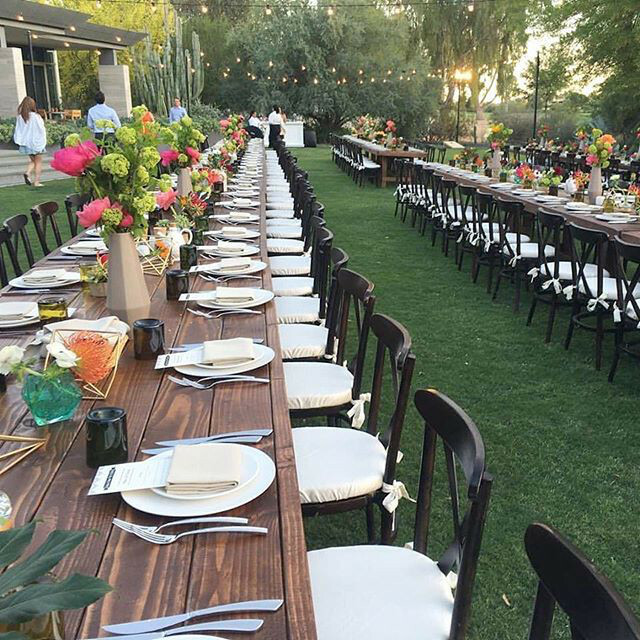 Scottsdale Farm Tables are a husband and wife duo dedicated to building and offering beautiful handcrafted tables for any event. We are happy to have their tables at our event and can't wait to have you experience your dinner and table discussions at these unique tables. During our yoga session the room will be filled with a gorgeous aroma of brandied plum and citrus & pine to make our minds feel clear and re-energized for the night. Each candle is hand-poured into it's own unique vessel that is a hand-made ceramic that was designed to live on after the candle has served its purpose.